It’s a new year, and I bet you picked up a few shiny tech gadgets to play with over the holidays. 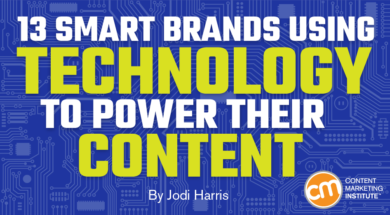 But while your Google Home pods, face ID-enabled iPhones, wearable fitness trackers, 3D printers, and the like might be fun and games now, there’s serious power behind those tools – power that enhances the performance of your content marketing efforts, makes them easier to produce, and makes them more enticing to your audiences. If you read our recent 2018 Content Marketing Predictions e-book, you may have noticed how many experts anticipate tech-enhanced experiences to dominate the content landscape. For example, HubSpot’s Scott Brinker predicts chatbots and voice interfaces will experience explosive growth. Autodesk’s Dusty DiMercurio sees an impending rise in augmented reality content at live events; and Chief Content Officer’s Clare McDermott is all but ready to bow down to the AI overlords and embrace a more automated future. These expectations of greater tech dependence are likely well founded. 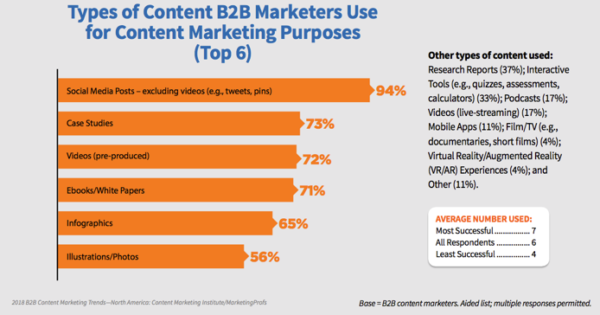 For example, according to CMI’s 2018 Benchmarks, Budgets, and Trends research, 25% of B2B and 28% of B2C marketers report content marketing tools and technologies have contributed to their increased levels of success over the past year. However, the degree of tech sophistication our predictors envision for content marketing isn’t going to happen overnight. Consider this: While CMI’s research shows tactics like social media, videos, and infographics have adoption rates of well over 50%, only 4% of marketers say they are working with machine-learning-driven content formats like virtual reality or augmented reality. Fortunately, this means there’s lots of room for today’s more advanced communication technologies to find their footing on the marketing landscape – and plenty of time for businesses to leverage them before falling behind the curve. If your business is thinking about indulging its inner technophile, let these cool content examples from intrepid brands inspire you to swallow the red pill and enter the Matrix-like world of machine-driven storytelling. As Paul Roetzer, founder of the Marketing Artificial Intelligence Institute, told the CMW 2017 audience, you don’t need a degree in computer science or computational mathematics to incorporate AI into your content efforts: “You don’t have to know how it works. You just have to know that there are AI-powered tools that do things you weren’t capable of doing before,” he says. As Julia McCoy recently pointed out, content creation robots are here, helping publishers like The Washington Post, Associated Press, and others keep up with the high demand for up-to-the-minute information. By using AI software (like Narrative Science’s Quill or Automated Insights’ Wordsmith) to handle their most fact-driven news responsibilities, publishers can free their writing staff to tackle more nuanced reporting while enabling their operations to be more productive – and more profitable – overall. For example, the Los Angeles Times created a tool called EQBOT, which automatically writes and delivers critical information – like magnitude and location – whenever it picks up data from the U.S. Geological Survey indicating an earthquake in the metro area. The robot even has its own Twitter handle. While most marketers don’t necessarily need to publish content at the speed and volume of a major news agency, there are plenty of other ways brands can take advantage of AI-powered content creation. AI tools can make messaging more targeted and valuable to your audience members on an individual basis. For example, Paul Roetzer shared at CMWorld an example of how the NBA Orlando Magic uses Wordsmith to personalize emails and in-app messages to fans and ticketholders, which are triggered by pre-set rules, conditions, or available offers like ticket resales. DigitalSTROM – a company that provides smart home systems – uses a customized version of Wordsmith to deliver original, on-demand status reports and other service-related narratives to customers through its app and via email. 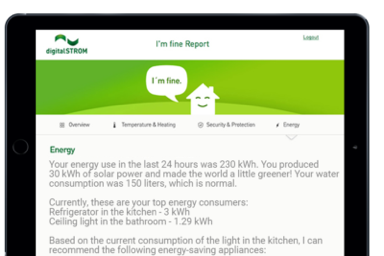 These content pieces help keep DigitalSTROM users informed on relevant topics (like the status and comparative impact of their home energy usage) in a personalized way – a value-add that can go a long way toward increasing consumer trust and satisfaction. AI-driven content distribution platforms that are chatbots and virtual assistants are growing more popular. Not only do these messaging tools enable companies to engage in helpful, human-like conversations, they can respond to all manner of customer queries around the clock, around the world, and even when customers are on the go (through familiar social platforms like Facebook Messenger, SMS, or Kik). While some chatbots can be simple, scripted affairs that don’t require true AI, the more intelligence a brand puts into its bot, the more value they – and consumers – are likely to get. For example, Taco Bell’s Tacobot does one thing, and it does it well: It helps hungry patrons order a meal for pick-up through Slack. But should patrons have a more complex or unique task (say, reverse-engineering the ingredients to create their version of the world’s most expensive taco), they would need a much bigger bot. On the other side of the spectrum is Nadia, an intelligent personal assistant developed by Soul Machines. “She” is an experimental avatar created for the Australian government to give people with disabilities better access to information about their national insurance benefits. Not only can Nadia convey human emotion in her conversations, she can “read” the emotional state of those who talk to her (by analyzing vocal tones and facial expressions), helping her to gauge the most appropriate response. Another form of AI is decidedly less chatty, yet just as versatile: automatic identification and data capture (AIDC). The term refers to a range of technologies that can automatically identify an object, correlate it with other known information about the object, and apply that data to complete a designated task. This tech category covers everything from the simple bar codes on virtually every product sold and RFID tags used for luggage routing and UPS order-tracking, to sophisticated biometrics systems that recognize a person by fingerprints, retina patterns, or facial characteristics, and provide them with personalized content and experiences. As Karola Karlson pointed out, marketers can use image recognition to build a seamless bridge between their online presence and in-store experience. For example, by using AIDC software to recognize a loyalty program member who entered the store and using the member’s profile data with AI-managed push notifications, retailers could deliver anything from personalized welcome messages to on-the-fly discount offers or customized product recommendations. 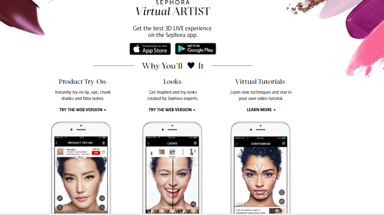 Speaking of product recommendations, consider what cosmetics company Sephora is doing with its Virtual Artist mobile app. Users can upload a selfie to the tool, which uses AIDC technology to map their unique facial features and gauge their skin tones (for color-matching purposes). Then, using an augmented reality overlay (more on this later), the app gives the consumer a 3D-enhanced preview of how they would look in certain shades of a product or with the application of a makeup trend. If they like what they see, they can buy the products through the app or save the selection for their next visit to a Sephora store. While voice recognition also falls under AIDC technology, its potential to radically disrupt the way brands communicate with consumers, generate and analyze audience data, and position their content for optimal reach and impact places it in a category all its own. How important will voice be to the future of content marketing? According to ComScore, by 2020, 50% of consumers will interact with voice-activated technology. This should come as little surprise, considering how popular voice-controlled smart systems like Amazon Echo and Google Home have grown over the past few years – and how remarkably versatile the application of these tools can be. Despite consumers’ rapidly growing enthusiasm for voice-enabled devices, most brand marketers are still searching for the magic formula for adding voice recognition capabilities to their creative content efforts. Fortunately, it’s still early, and brands willing to experiment now will have a tremendous opportunity to set themselves apart from the competition. But they had better act quickly: With more consumers plugging voice capabilities into their everyday lives, the playing field won’t be this clear much longer. One early adopter that is a natural fit for voice-enhanced storytelling is USA Network’s Emmy-winning series, Mr. Robot – a show in which main character Elliot regularly breaches the fourth wall to talk with the audience as if the viewers were his personal confidant and invisible co-conspirator. 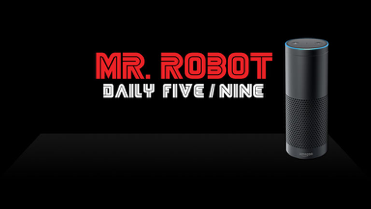 To extend a Season 3 storyline full of tense action, tenuous alliances, and surprising reveals, USA launched an interactive choose-your-own-adventure-style game for Amazon’s Echo device called The Daily Five/Nine. Players answer questions, make choices, and guide their mysterious partner in cybercrime through a series of obstacles that may or may not result in being recruited into the show’s shadowy cabal known as The Dark Army. 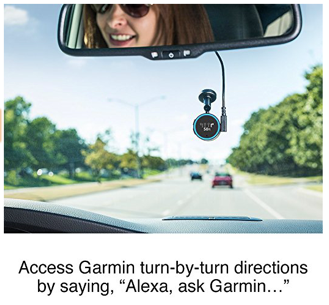 On the more utilitarian side of voice-activated content capabilities, GPS tech company Garmin has partnered with Amazon to produce the Garmin Speak, which enables Echo users to access music and games from their entertainment libraries; request news, traffic, and weather briefings; and interact with other Amazon-based content and information features – all while traveling in their car. The device also connects to users’ Bluetooth-enabled smartphones to provide voice-activated, turn-by-turn directions to their destinations – without having to fumble with a separate GPS device. HANDPICKED RELATED CONTENT: Voice Search: Is Your Content Prepared for the Verbal Revolution? Few advanced technologies can compare to the use of virtual reality (VR) and augmented reality (AR) when it comes to delivering a story in a rich, immersive, and compelling way. And, as StoryUp CEO Sara Hill pointed out, when paired with 360-degree camera technology, not only can it be used to put the audience in the middle of the action, it can allow them to participate in experiences they might never access in real life. Zenith Aircraft Company, which sells kit planes, wanted a way to enable prospects to take a demo flight even if they were unable to travel to its facility. StoryUp created a VR experience for Zenith that does just that. According to Sarah Hill, not only was the video highly watched and shared, the cost per impression was lower than some of the company’s other content campaigns – meaning the project used advertising dollars more efficiently (not to mention it saved on the cost of jet fuel). If life-like simulations fall outside your strategic goals (or your content budget), consider incorporating AR technology as an enhanced alternative to standard, static content experiences. Adding an AR overlay gave GumGum HoloTats a way to delight the audience at the 2017 Clorox iConnect event and deliver a little unexpected creativity. At the company’s exhibition booth, GumGum handed out boxes of its beautiful tattoo stickers custom-designed for the event along with a prompt to download the company’s AR app to view the tattoo in full holographic splendor. Not only was the campaign a hit with attendees, it impressed the Content Marketing Awards judges enough to earn it the 2017 title for Best Use of Content Involving Machine Learning/Artificial Intelligence. 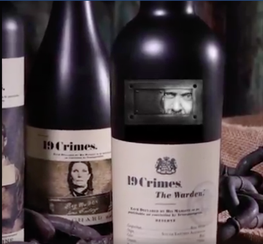 Then, there’s 19Crimes, a wine-and-spirits brand that built its marketing platform around compelling storytelling. In the late 18th century, English rogues and rebels found guilty of at least one of 19 crimes were exiled to the new colony of Australia as punishment. Today, 19Crimes gives some of those convicts an AR-enabled voice to tell their historically rooted tales: By scanning the company’s wine labels with its digital app, consumers are treated to a glimpse of the exiled convict’s life, crime, and later experience as a pioneering colonist. While novel now, these techniques will grow commonplace. It’s as good a time as any for your brand to explore the creative possibilities these technologies offer – or at least keep a close eye on them as their application opportunities expand and grow more advanced. Learn more about how to use technology to make your content marketing program even better. Register today for the Intelligent Content Conference March 20-22 in Las Vegas.